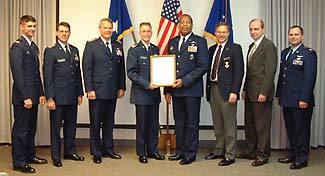 C/Col Jonathan Sundman presented Spaatz Award #1483 by Lt Gen John Hopper, USAF. C/Col Jonathan Sundman received Gen Carl A. Spaatz Award #1483 during a ceremony in his honor at Randolph AFB, Texas on 11 March. Maj Steven Schultz, Spaatz #904, served as narrator for the ceremony in which Lt Gen John Hopper, Vice Commander, Air Education and Training Command, presented C/Col Sundman his Spaatz Award certificate and medal. 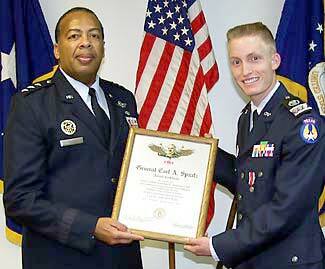 Brig Gen (ret) James Jaeger, Spaatz #80, presented C/Col Sundman with the new Spaatz Association coin. Other Spaatzen in attendance included: Col (ret) Mike Snedeker, #134, Lt Col Ed Billman, #419, Capt Kevin Sonnier, #1049, and AFROTC Cadet Paul Wilson, #1407.